Compromised is the story of a British Special Forces soldier kidnapped by the IRA in Belfast during The Irish Troubles in 1989 – the first part of the story is relentless in its pace and covers a time period of less than 12 hours focussing on the kidnapping and interrogation of the soldier. In contrast the second part of the novel covers the years that follow the kidnapping through a series of snapshots of key events affecting the principle characters against the backdrop of The Troubles, interwoven with insights into the activities of British intelligence and security agencies. 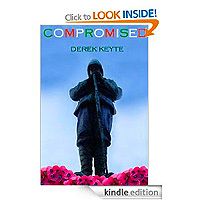 The third and final part of Compromised is set in 1997 where, with the promise of a real prospect for peace looming across the whole of Ireland, there will be a final reckoning. Derek Keyte has got a problem... How can he better his debut novel. Compromised is a fantastic novel well deserved of 5*. His 'inside' knowledge tells and he uses it well, no super hero's just ordinary guys getting the job done. I couldn't put it down, I tried (without success) to out think the author. He is far to clever. A superb book you will not regret buying at any price. I look forward to the next novel, but my goodness the author has his work cut out to beat this one. Congratulations to the author.